Home »Bucks County Technical High School»Automotive Experts! 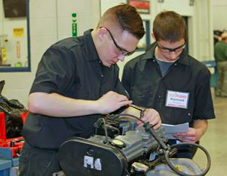 Seniors, Ray Lamer and Szymon Wisniewski par­tic­i­pat­ed in the 2019 Greater Philadelphia Automotive Competition host­ed by the Automotive Training Center held March 8, 2019. Twelve teams par­tic­i­pat­ed in the 5 hour event. Our stu­dents placed sec­ond. The first place team earned 1,320 points. BCTHS scored 1,278 only 42 points dif­fer­ence. Congratulations to the win­ners and their Automotive teacher, Mr. Byron Cesari! ← Previous Previous post: Winners at State DECA!